Take the tinny with you! The Custom Boat Loader allows one person to safely and easily load and unload an aluminium dinghy from their 4WD roof using a cordless drill or fully wireless remote controlled version, in about 2 minutes! With a Custom Boat Loader you can place the boat in the water if you can get to it! Secure it down for travel whilst also providing ample roof rack storage. We also make a heavy duty version to suit the larger boats on the bigger vehicles. The ample mesh roof rack carries many of those bulky items & can be used, whether in conjunction with the boat, or simply as a roof rack. You may not need a boat trailer with its ongoing maintenance, registration and insurance costs, nor can the trailer be stolen from the public boat ramp whilst you’re away fishing! The Custom Boat Loader is robust, self-contained and maintenance free. Place the boat in the water if you can get to it! One person can load & unload with ease. Custom made for most 4WD vehicles. Easily removed if not required. Doubles as a roof rack. Simply the best rear boat loader on the market! Start your dream set up, TODAY! The heavy duty, but lightweight construction, is virtually maintenance free and perfect for the serious 4WD’er and those traveling with a caravan and wanting to take a boat too! 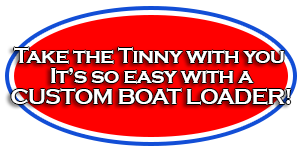 It keeps the fun in boating by taking the hard work out of taking the tinnie with you! Custom Boat Loaders can advise you on the type of boat and outboard best suited to your requirements, and can put together a package and quote on a boat, outboard, fold up trailer and all the tinnie mods. A one stop shop for all your boating needs! Our Custom Boat Loader Outboard Trolley is the perfect way to load and unload your outboard in and out of your vehicle without breaking your back. It also allows your outboard to be stored in the corner of your shed or carport in an upright position using minimal space. A one stop shop for all your boating needs! Detailed demonstration of use and features.